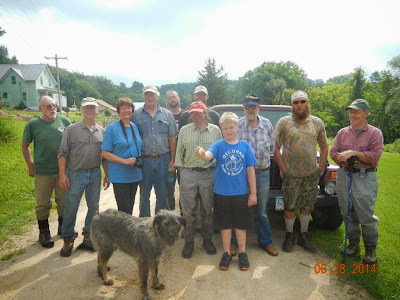 Trout Unlimited members gathered in Waterville, Iowa on Saturday, June 28, 2014 to assist Richard Kittleson, Northeast Iowa RC & D Japanese Knotweed Project Leader in learning how to bend this very aggressive plant. Bending the plant is thought to weaken it and make it more suseptible to chemical treatment. On Saturday, November 9, TU and HFFA members from around the state of Iowa worked to install native seed and straw mats on the newly improved banks of Waterloo Creek in northwest Allamakee County. Twenty two individuals participated plus two employees of the Iowa DNR fisheries department to install over 2000 feet of straw mat. Site work done prior to the work day included sloping high muddy banks back to a level that would allow water to flow over and out of the banks in the event of high water instead of into the bank and eroding soil into the stream. In May of 2013, 140 friends of the cold water fisheries of northeast Iowa gathered in the upper level of the Elks Lodge to celebrate another year of educating the public and improving trout fishing in northeast Iowa. Funds raised at this banquet will assist in educating the public about our cold water resource in northeast Iowa and improve and acquire new water for public fishing.